Rainbow sheen and oil are visible from a plane above these oil company pits in northern Wyoming. The stream leading from the pits also shows oil. Birds land on pits like these, thinking they are places to rest or feed, only to get trapped and die. As we fly in a small aircraft on a blustery spring day in northern Wyoming, two former U.S. Fish and Wildlife Service agents direct my attention to a cluster of oil field wastewater pits below us. Thick black oil blankets one of them. “That’s a bad pit. Completely full of oil. That’s ugly,” says Gary Mowad, who retired from the federal agency in 2014. Swirly rainbow sheens glimmer on the surface of two adjacent pits the size of community swimming pools. Tarry oil floats on the edges. Birds are lured to these pits, thinking they will provide respite, food and drink in this dry region. Gary Mowad, a retired agent for the U.S. Fish and Wildlife Service, pioneered a federal program to clean up oil pits and protect birds. But the Trump administration swooped in and made it legal for industries to kill birds in oil pits, as long as it’s not intentional, even if it’s avoidable. “Those would kill birds,” says Mowad. Seeing these pits torments him because countless times in the past, he plucked dead and dying birds from oily sites like these. The former agents’ mission is to show me the danger that birds face from a Trump administration decision that reversed a policy that had saved millions of birds for five decades, during both Republican and Democratic administrations. The energy industry influenced the administration to adopt this new interpretation, according to an investigation published by Reveal from The Center for Investigative Reporting in March. 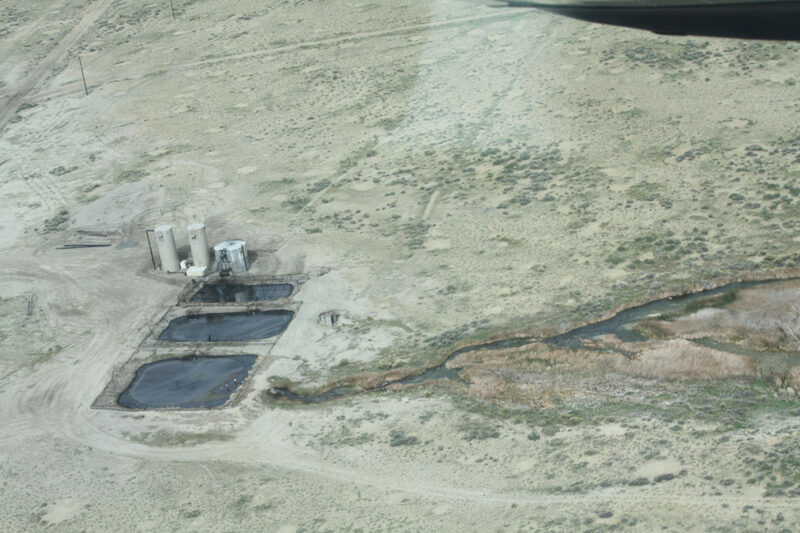 On a short flight over oil fields in the Bighorn Basin, the two retired agents spot dozens of these pits. 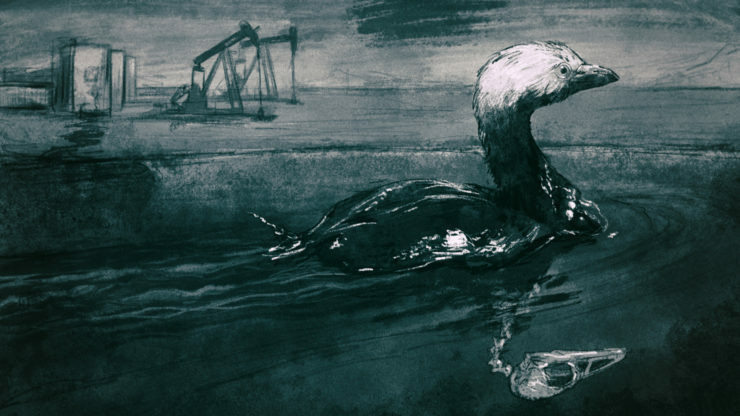 During their careers they collected the remains of hundreds of birds at oil and gas production pits across the West. Dead birds decompose or sink quickly, so the numbers discovered are only a tiny fraction of the half million to 1 million birds killed every year at oil pits, according to a Fish and Wildlife Service estimate. When agents found live songbirds, ducks and other birds trapped in oil, they had to break their necks to end their suffering. “When you find them and they’re still alive, they’re in really bad shape. I mean you have to euthanize them. You’re just not going to (rehabilitate) them. It’s gut wrenching,” says Mowad, who rose to deputy chief of law enforcement at the agency before retiring. In the mid-1990s, Mowad, a pilot, saw pits like these in Colorado from his own plane, and was inspired to pioneer a federal program to clean up pits to protect birds. He and other agents flew over oil fields and when they discovered oily pits, they recorded the geographic coordinates and gave companies 30 days to clean them up or face fines or prosecution under the 1918 Migratory Bird Treaty Act. The act makes it a crime to kill any migratory bird or destroy nests or eggs “at any time, or in any manner” – unless you have a permit. But in December, the Trump administration’s top lawyer at the Interior Department issued a legal opinion declaring that the law only applies to intentional killing and not when industries kill birds, even if those deaths are predictable and avoidable. Several current and former Fish and Wildlife Service scientists and agents worry that without the fines and prosecutions, many more birds will die. But industry representatives say that oil companies will keep protecting birds despite the new policy. Sgamma said that oil companies have switched to storing wastewater in closed containers, instead of open pits. “Most modern operations do not use open pits so that again has taken away a source of potential bird deaths and will continue to operate those in that manner,” Sgamma said. The oil and gas industry has no data on how many pits remain in use, according to industry trade groups. Not all states keep track of wastewater pits, but some do. Colorado has more than 3,000 active pits and Louisiana has over 900. California has about 700 active pits, and Arkansas has 286. Wyoming’s Oil and Gas Conservation Commission website lists thousands of oil drilling sites, but does not sort them by which have open pits. 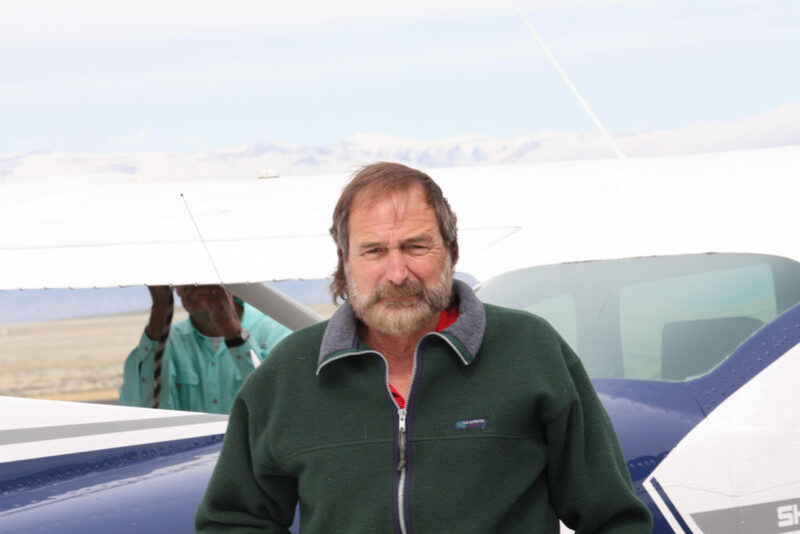 To underscore that many open pits remain, Mowad asked another former agent, Mark Webb, to fly in his personal plane over oil fields in northern Wyoming. In the distance, the Rocky Mountains are shrouded in clouds as the three of us fly over an oil operation. We see a few rectangular-shaped pools. They’re covered with netting and the former agents say the company is doing what it should to protect birds. Then a pungent odor reminiscent of rotten eggs fills the cockpit. That’s hydrogen sulfide from a different oil production site below us. One pit is covered with what the former agents call “oil sludge.” Other pits at the same operation also have thick oil on them, and swirly rainbow sheens visible from the air. “That’s a killer,” Mowad said. It only takes a little oil to kill a bird. Oil entraps them, and they die from exposure or starvation. Oil also can poison birds when they ingest it while preening, according to toxicologists. We fly over several other oil production sites. The pits aren’t covered with netting and oil is visible on the downwind side of the pits. Rainbow sheens glimmer on the surface of others. We fly over about 30 pits, and most are clearly oily, according to the former agents. In some cases, the surrounding wetlands and streams are blackened, too. After the flight, I told Sgamma what we saw. She reiterated that modern oil operations use closed containers instead of pits. When pits are used, she added, Wyoming requires operators to cover them with netting. If oil is found on the surface, the operator must clean it up. But the agents worry that without the fines and prosecutions, many more oil production operations will look like the ones we flew over. Birds will be attracted to the ponds. What look to them like places to rest, and find a drink and a bite to eat, instead will be where they meet painful deaths. Intern Susie Neilson contributed to this story. It was edited by Marla Cone and copy edited by Nadia Wynter.